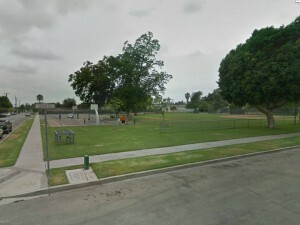 In 1874, San Fernando became the valley's first organized community. The City of San Fernando offers 7 park facilities to help provide recreational and community services. 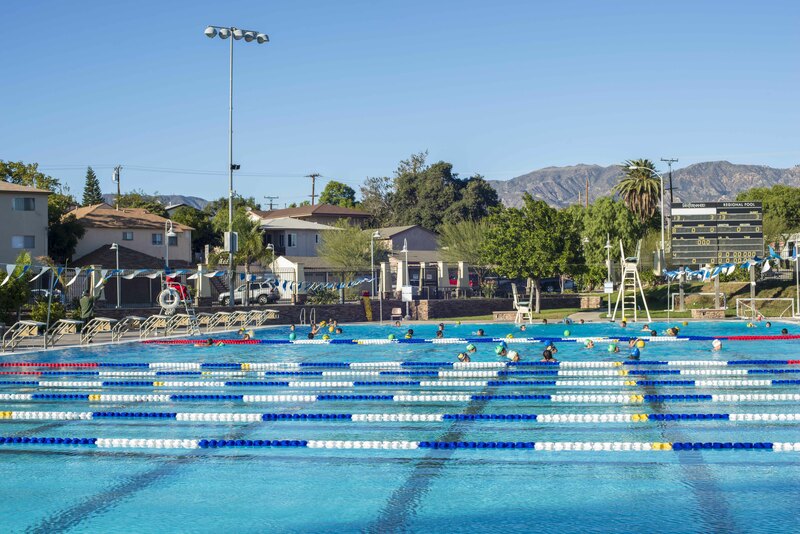 All facilities are within a 2-mile radius and are conveniently located. Activity rooms, picnic areas, and softball diamonds may be reserved for private use (see Facility Rental below). 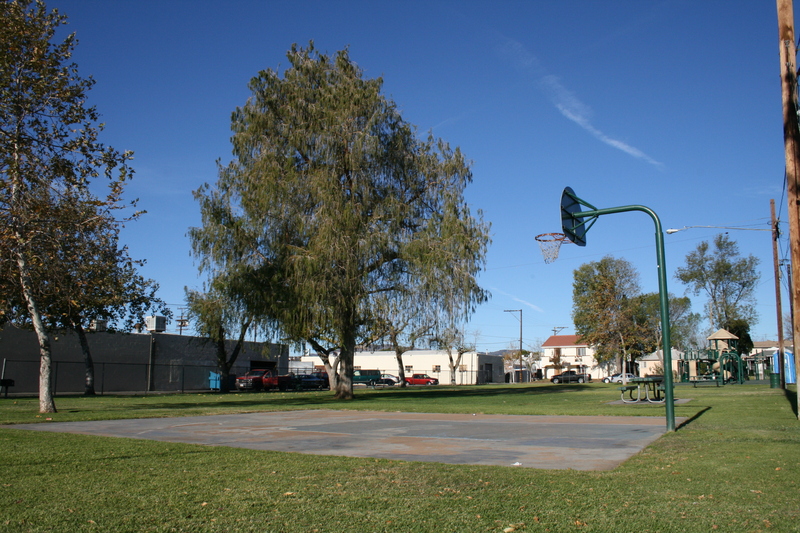 Some areas that are not reserved such as picnic areas and softball diamonds are available on a first-come, first-served basis. 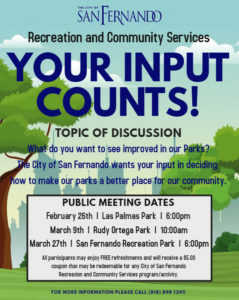 What do YOU want to see improved in our parks? Enjoy free guided tours every 4th Sunday of the month, or by appointment. 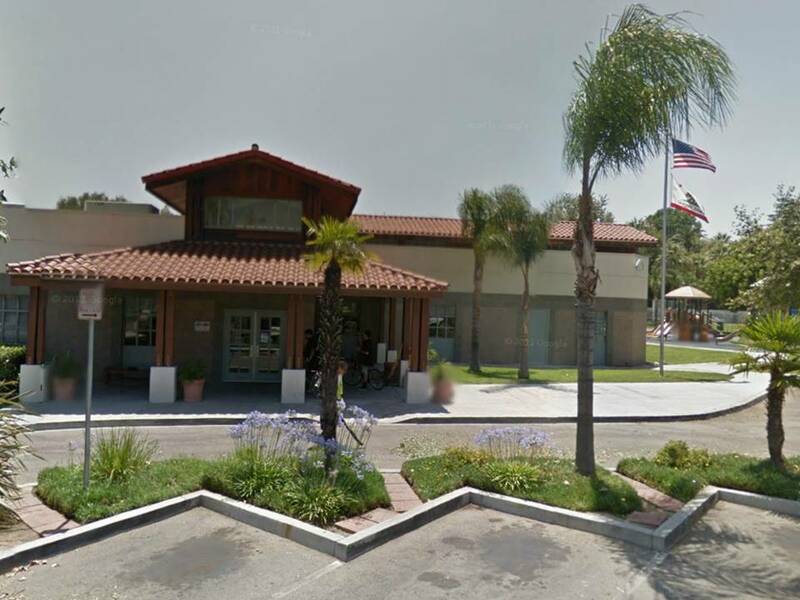 LOPEZ ADOBE WILL BE CLOSED IN MAY 2018 DUE TO THE MEMORIAL DAY HOLIDAY. The property was acquired from the King of Spain via a grant to DeCelis. The chain of title deed is on display in the dining room of the adobe. An upper apartment was the home of a daughter, Kate Lopez Millen from 1931 until her death in 1961. 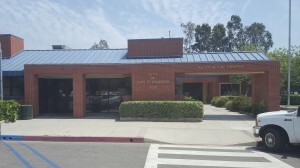 Her children sold the adobe to the City of San Fernando in 1970. This purchase was made possible by a Historical Preservation grant, given to save the house from destruction. The 1971 earthquake did not do too much structural damage and, in 1974, it was restored as the original building for use as an early historical site. A group of San Fernando citizens, students and organizations contributed time, labor, talents, and money to prepare the home for its grand opening on April 5, 1975. The adobe is registered as a National Historical Site, a state and county Historical Site, and the California Historical Advisory Committee says it is considered an important historical point of interest in the state. 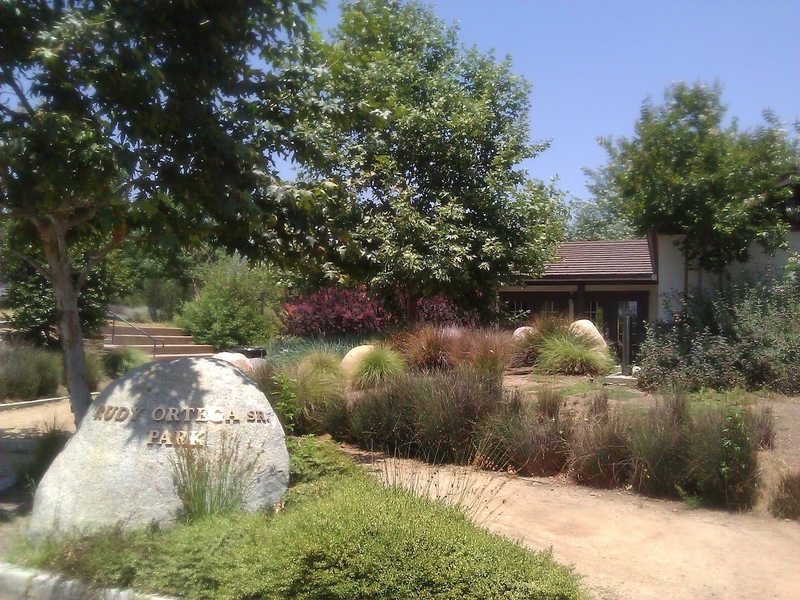 San Fernando has been presented with a Gold Seal Award from the San Fernando Valley Beautiful Association for the beautiful Casa de Geronimo Lopez adobe and the grounds surrounding the home. The Lopez Adobe is currently looking for docents, administrative, and community service temporary volunteers. We are especially in need of docents who can lead tours in Spanish or English, and enjoy working with children. No experience is necessary, and training and materials are free. If you are interested, please complete and submit an application (see Forms Section below). After filling out/submitting the application, our Museum Coordinator will call you to schedule an interview. If selected, you will be asked to complete a background check, attend a docent training, and volunteer orientation. The training course for docents and volunteer personnel emphasizes teaching techniques, and the museum’s collections through lectures, workshops, and readings. The César Chávez Memorial honors the legacy and work of the late farmworker leader. The construction of the memorial is the culmination of efforts by many community members who recognize Chávez’s impact to promote justice and equity for all Americans. The memorial is developed on a 23,000 square foot area of land in the City of San Fernando. The concept for the memorial consists of four separate art pieces placed in a park setting. The City along with various community organizers sponsors an annual march in honor of Chávez. The City of San Fernando, preceding the State of California’s decision, became the first in the nation to designate his birthday, March 31, an official holiday. The memorial consists of four different elements reflecting the life of César Chávez and the farmworkers struggle, a single life size statue of César Chávez is poised in front of a series of ten figures representing the farmworkers plight and eventual empowerment. Other features also designed by the artist include a fountain and mural. 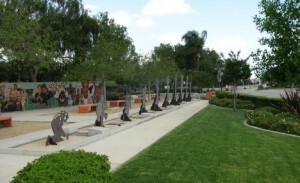 The fountain is in the shape of the United Farmworkers (UFW) eagle symbol, with the “César Chávez Prayer” inscribed on one side and painting on the other side. The mural is 100 feet in length and provides a visual chronology of César Chávez life. The artist selected to design the Memorial, Ingacio Gomez, is a well known community artist who has been involved in various art projects in Los Angeles and throughout the nation. 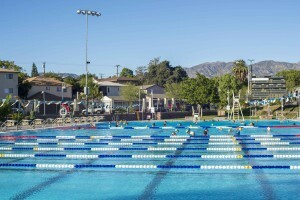 The San Fernando Regional Pool Facility is operated by the Los Angeles County Department of Parks and Recreation. 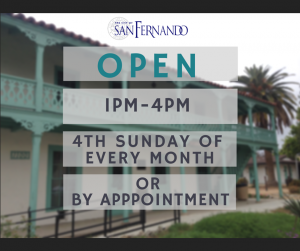 Whether you are planning a small meeting or a large wedding, the City of San Fernando provides the ideal setting for your event. With a variety of settings and very reasonable cost, the City of San Fernando provides various indoor facilities to be rented for weddings, private or corporate functions, quinceañeras, birthday parties, luncheons or filming for movies, television, videos and commercials. Indoor locations are available for private rentals up to 10 p.m. Sunday -Thursday, and midnight Friday and Saturday. A complimentary one week hold may be placed for your site during which time a conditionally refundable security and cleaning deposit (amount varies upon location) and a payment of 20% of the total must be received to secure your date. All reservations must be made at least ten days prior to the reservation date. Food and beverages are permitted in event area only. No cooking on site. Conditionally refundable damage and cleaning deposit, payment of 20% of total, and $5 application fee are required upon signing of the contract; balance is due two weeks prior to event, payable to the City of San Fernando. Fee includes tables (round and/or rectangular) and chairs. Customer must include set-up and clean-up time in rental time. No smoking or consumption of alcohol allowed anywhere on the property.